Sorry Glenn brain fade on my part I can only apologise. I'm thinking Glenn then type Garry, I am not properly awake yet. I have lots more photos of shortline railroads in the Southeast United States and I'm always happy to share them with anyone. Look under Railroad histories and you will find a bunch of past and present shortlines railroads. If I can ever be of help with photos, please let me know. If we had a place here to post US railroad photos and information, I'd be happy to post lots of stuff. Keep those photos comming, I'm really enjoying seeing them!! Thanks Glenn for some more fabulous links, I had no idea there were so many short lines. It will take years to study them all properly. 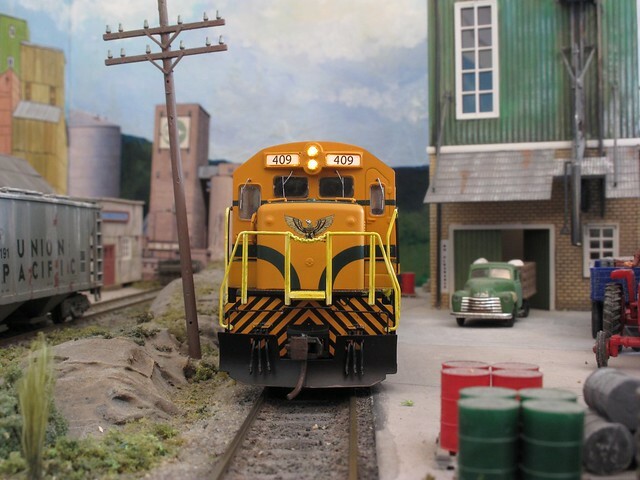 By wanting to see more pictures of the layout you have done my ego no harm at all. 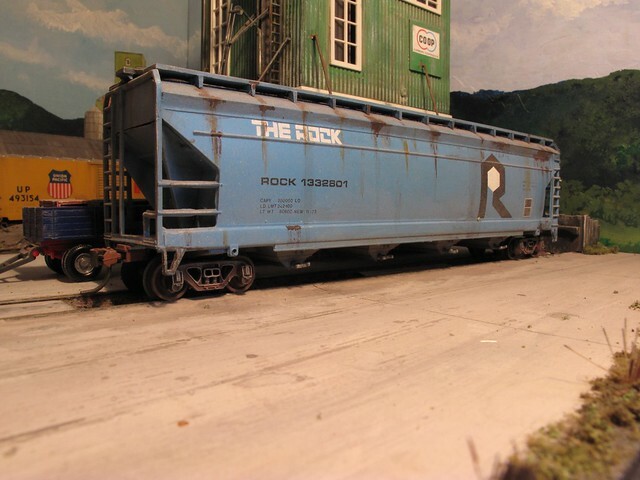 A faded bankruptcy blue RI covered hopper sits on the team track at Colonel’s Crossing. The Pennsy steel gondola next to it has a load of agricultural limestone waiting to be collected by local farmers to spread on their land to improve the soil quality. The CAT loader is for the pulp wood flats. The rock formation hides a sharp curve behind it. It is made of polystyrene blocks roughly cut to shape then covered with old pieces of cloth soaked in poly filler. When this was dry more poly filler was added with a spatula and then carved when dry. The whole was then painted with several washes of emulsion paint and acrylics getting darker with each wash. When dry it was lightly flicked over with a dry brush. Then it was covered with ground cover and some cheap trees that had been covered in pva then dipped into various coloured flocks were added. 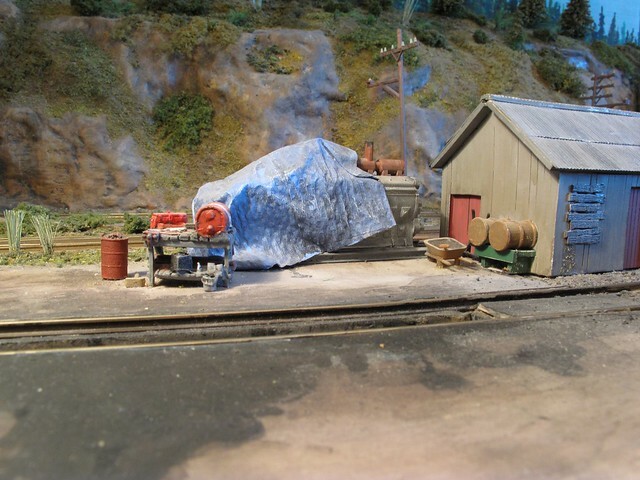 The structure behind the gondola is a disused ore loader made from odds and ends from the scrap box. There's a lot of shortlines all around the US and those links are just a small portion of them. There are many, serving many purposes and industrial needs. The scene looks good...Keep the photos comming. Glenn as you seemed rather fond of the Conrail B23 - 7 here are a couple more photos of the locomotive working at Colonel‘s Crossing. 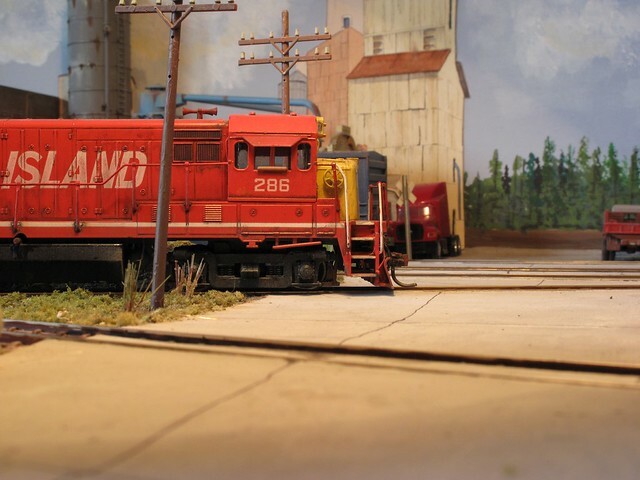 The model is a visitor on my layout, it actually belongs to Andy the guy who has taken the photographs. I’m sure he will fill us in with the details about it. Glen you can post prototype pictures in the Bar section of this forum, those links you gave are excellent especially the Meridian & Bigbee pics. Thank you very much Ken!!! I'll work on some shortline posts and put them in The Bar. I have plenty of updated photos to add to my M&B story. Thanks for your comments Jordan!! 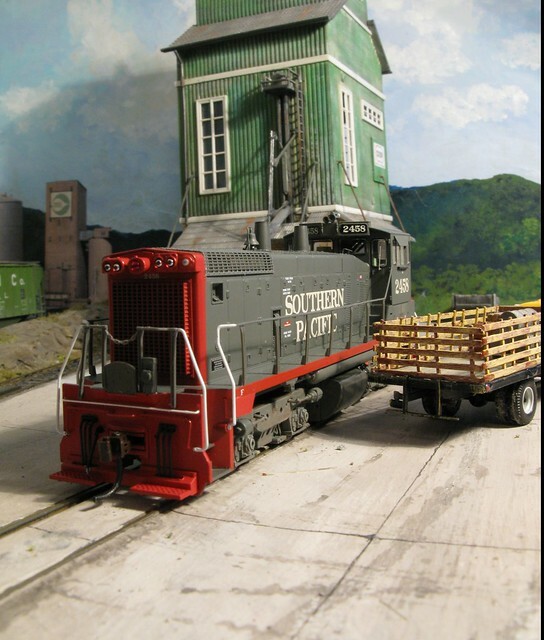 Believe it or not, I get more US switching layout ideas from my friends across the big pond rather than actual US modelers. Due to space limitations, I'm currently trying my hand at building a shelf type switching layout in N scale. This is totally different that anything that I have ever done. But I have found lots of inspiration and ideas here. There's another shortline based out of Meridian, Mississippi, near the M&B, called Meridian Southern. 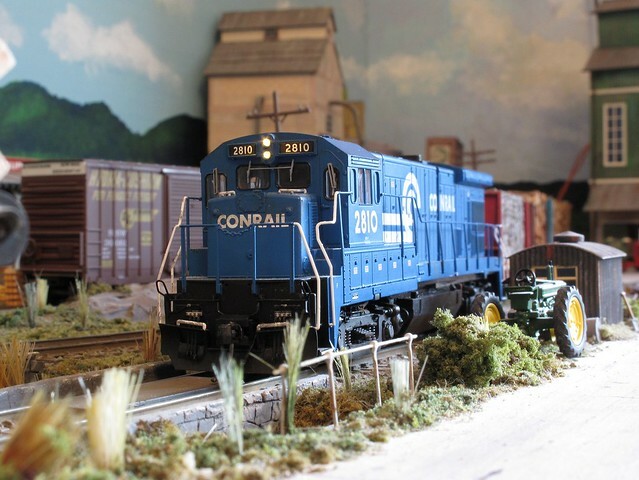 They operate 5 of those ex-Conrail B23-7's that are still in Conrail paint, but sub-lettered MDS. I'll do a post and photos on them soon. Ken you mention lots of activity on the team track, here we have a Rock Island covered hopper at the Farmer’s Coop and the other team track at CC. The road surface is three layers of card glued down and allowed to dry thoroughly. It was then painted with several coats of emulsion paint tinted with drawing ink and water colour paints giving it a flat slightly textured finish. A black fine line pen is used to represent the joins and cracks in the concrete. One of the industries served by CC is drilling mud which arrives by truck and is then loaded into box cars. The thing is a team track is so versatile and needn’t take up too much room. An SP SW1500 in as new condition so it is obviously brand new, sits next to the Farmer’s Coop and team track at Colonel’s Crossing. The truck is picking up some fertiliser and seeds for a local farmer. A few of the details at the loco re-fuelling and sanding facilities at CC. They are very minimal really. A small open engine house, out of shot to the left. 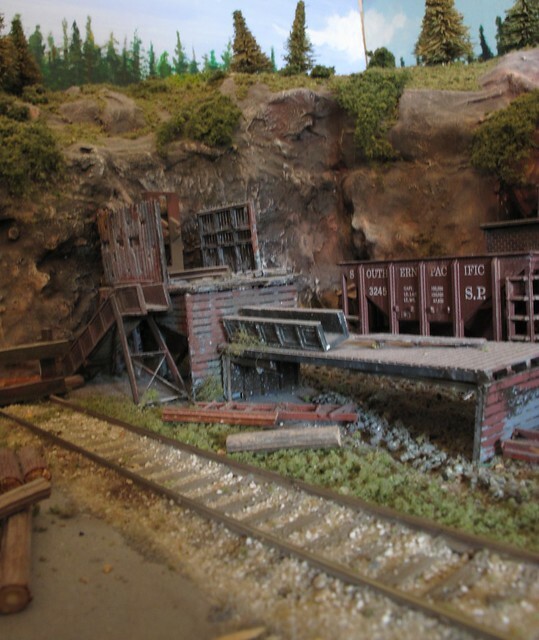 A scratch built sand drying house and an inspection pit between the tracks in the foreground. Tools on work benches and an EMD prime mover under the blue tarpaulin. (Kitchen towel soaked in pva then painted when dry, finally a flick over with a dry brush) The grounded reefer is a tool and spares store. It is assumed that freight cars are repaired here as well. This gives an excellent excuse for all sorts of cars to turn up on the layout from time to time. A view photographed from the flat roof on top of the flour mill at Benson showing the two UP geeps coming out of the flour mill head shunt track. 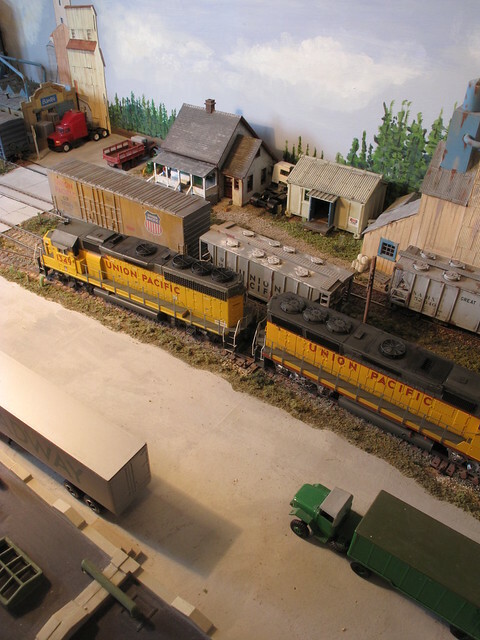 Between the house next to the crossing and the large grain mill can be seen a modified Ratio provender goods store. It now has much shorter legs and is painted to blend in with the grain mill. The back scene is painted with acrylics and has pen and wash drawings of suitable structures glued to it. 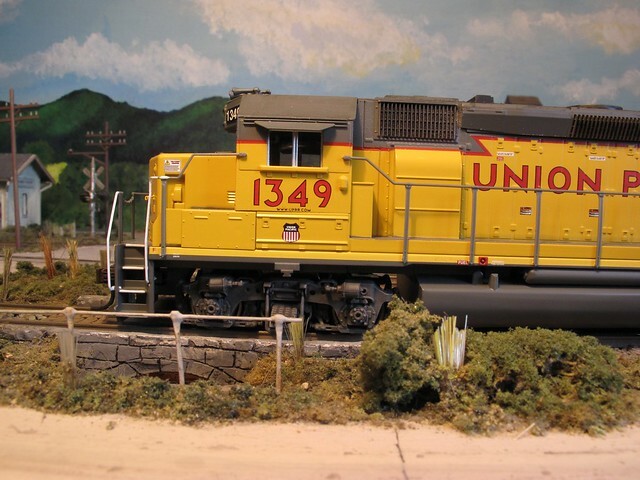 Here we see the UP duo about to roll over Colonel’s creek before coupling onto a westbound freight. The bridge sides are hardboard covered with a thin layer of poly filler, scribed and then painted with water colours. Rock Island U33B rolls over the grade crossing at Benson. These were the heaviest four axle switchers the Rock ever owned and were intended for pool service with the UP at North Platte. I bought this model second hand in very damaged and tatty condition and with a wide fly wheel less motor. I cleaned it up straightened the hand rails added more details and weathered it. 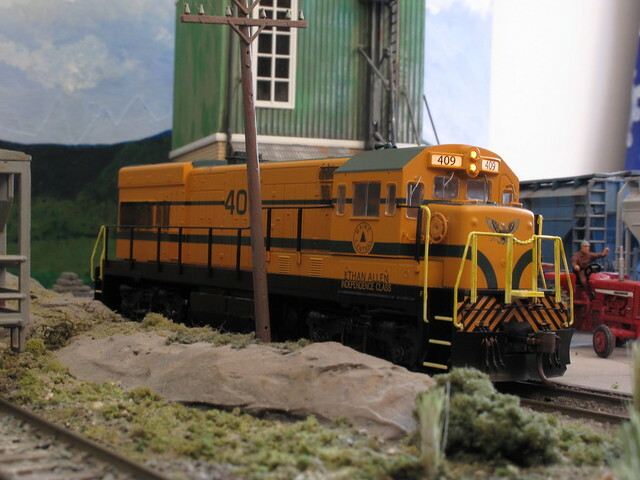 I lastly fitted a conventional modern Athearn motor and it has performed perfectly ever since. No 286 shows off its profile having spotted some cars in the flour mill head shunt. The tall cylindrical structure at the back seen behind the telegraph pole is a vertical tank store for fertiliser at RE Lee farm supplies. Another concoction from the spares box, and an excuse to spot a tank car from time to time. It is another model that takes up very little room if you are a bit pushed for space. You have lots of details in your scenes!! This is the first of the latest batch of photographs that Andy took a couple of weeks ago on his last visit. As usual he brought a couple of exotic examples of roads never normally seen in Arkansas. 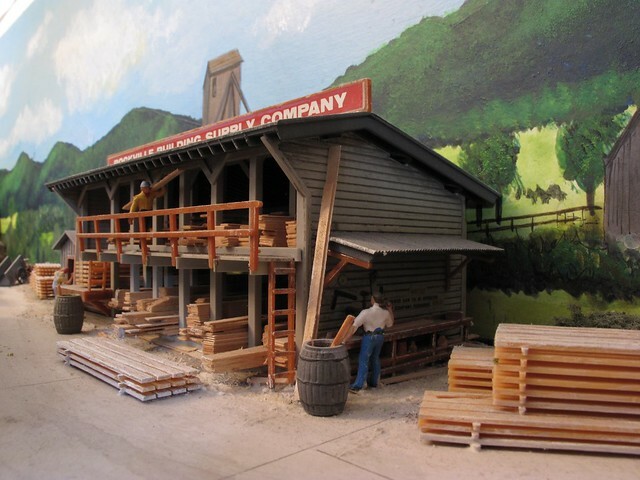 To start with though a picture of the Atlas Lumber yard kit. It has merely had a few figures strategically placed and loads more timber added to the racks. It is a mix of balsa wood and thin card tinted to look like freshly cut lumber, mostly sourced locally. Behind the building itself they make roof trusses and customised window frames that are shipped out in boxcars. The two photographs show Andy’s Boston & Maine U-Boat in the head shunt at Colonel’s Crossing. 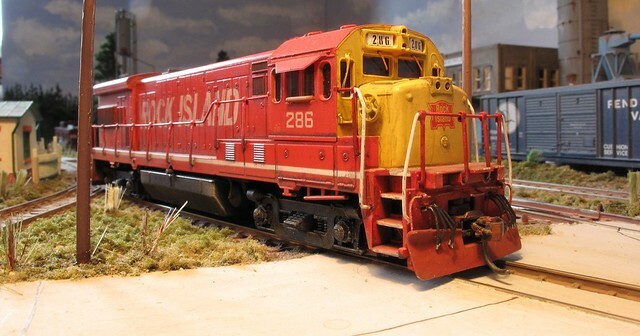 It is one of his all singing and dancing DCC equipped locos. The side view is taken looking from the back of the layout towards the front.